Christopher was born in April of 2002. His father died of "fever" in 2003 while he was in prison. The mother, Ruth Nalugwa remarried, and her new husband did not want Christopher. Christopher and his brother, Ibrahim Katende were sent from their village of Kasoozi to live with the parents of the deceased father. The grandmother's name is Rosemary Nakku. She wanted to get the children away from their abusive grandfather who is an alcoholic. The grandmother brought Christopher to Hope Children's Home when he was 4 years old. Upon arrival, he was very quiet and withdrawn. Christopher is now a very happy and active child. The Lord has washed away the unhappy memories and he is living in joy. He attends Sseya Community School and Sseya Revival Church. 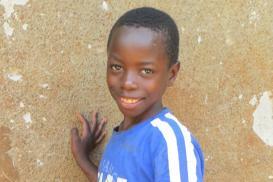 Luganda is Christopher's native language, and he is learning to read and write in English as well.